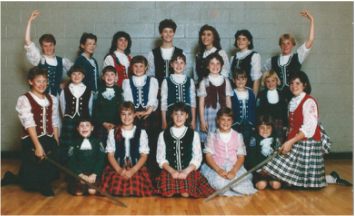 The Battlefords Highland Dancing Association is run by a volunteer parent board. We hire highland dance teachers and coordinate weekly lessons, as well as plan performances in the Battlefords. Dancers (boys and girls) are welcome to begin lessons as early as 3 years old, but it's never too late to start! Registration takes place in September, and lessons run from late September-May. Contact the Association through email. All dancers are encouraged to take part in community performances, often referred to as 'dance-outs.' These are great opportunities for dancers to demonstrate their hard work and share their love of highland dance. We perform in care homes, as part of community events, and almost anywhere we are invited to be! BHDA also plans two annual events that showcase our dancers: a Robbie Burns Ceilidh (or party) in January and the Tartan Tea held the first Sunday of June. Highland dance competitions are an opportunity for dancers to demonstrate their skill, increase their confidence, and meet other highland dancers from around Saskatchewan - or even the world! In Canada, competitions are sanctioned and governed by the Scottish Official Board of Highland Dancing. Dancers progress through competitive levels, from primary to beginner to novice to intermediate and finally to premier. Dancers at the premier level are also able to compete in championships. In Saskatchewan, competitions and championships are held throughout the year in North Battleford, Lloydminster, Saskatoon, Tisdale, Regina, and Moose Jaw. Dancers are also able to gauge their progress by taking part in annual medal testing. Administered by the Scottish Dance Teachers' Alliance, based in Scotland, medal testing involves dancers performing set dances for an adjudicator who then provides feedback and determines whether minimum standards for the given level have been achieved. Dancers earn beautiful awards through this process. BHDA was started in 1972 by 5 founding families: the Brubachers, Gordys, Grants, Wickenheisers, and Wilsons. They were grateful for the support of their patrons: Mr. and Mrs. Cockburn and Mr. and Mrs. Shepard. The first teacher was Mrs. Margaret Brubacher (72-74), followed by her son Kenneth (75-81) and daughter Shannon (79-86). The dancers were seen at many city functions and dance-outs, including the Battleford Chautauqua Festival. They were also a part of the Battlefords Dance Festival. When the association was founded, they designed a shield to decorate a float for the parade and then used the shield for advertising association activities. Years later when local competitions became a reality, this shield was used as the design on the medals.